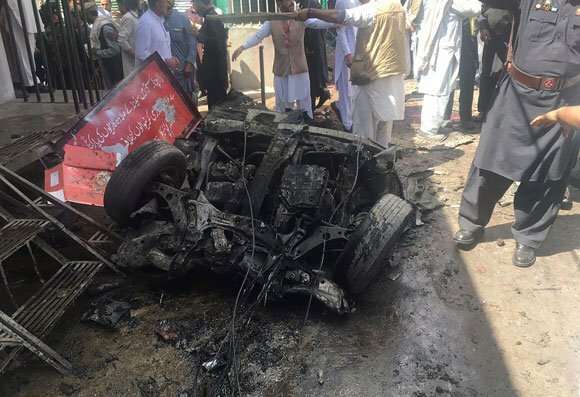 Terror returned to Parachinar in Kurrum Agency on Friday when a blast outside an imambargah located in a busy market claimed the lives of 24 people and left 90 others injured. Eyewitnesses told Geo News a vehicle parked by an unknown person outside the imambargah exploded at approximately 11AM. Mumtaz Hussain, a doctor at the Agency Headquarters Hospital in the region told Reuters news agency that patients were being brought to them in private cars and ambulances. To disperse the people who had gathered to protest the incident, security forces opened fire, that also injured several people. Around 95 of the injured persons were taken to Agency Headquarters Hospital Parachinar. Medical Superintendent Sabir Hussain told Geo News 27 of the injured were sent to Peshawar via the army helicopter. However, locals said the injured persons and their attendants were faced with difficulties at Agency Headquarters Hospital Parachinar due to the dearth of medical facilities and staff. Even though the issue was raised at the Eidgah explosion in Janruary, the hospital lacks the requirements to tackle with emergency situations. According to MNA Sajid Hussain Turi, who was present at the site of the blast, at least 11 people have been killed while over 100 others injured. He told Geo News that blasts have occurred in Parachinar in the past as well, but no terrorist has been arrested. Turi added that the security forces instead lash out at the locals only. The blast took place in a busy area of the city where nearly 15 to 20 shops are situated. The area was bustling at the time of the explosion, as it is Friday and people from other areas had also come for prayers. The intensity of the blast can be gauged from the damage that has been caused to the houses and cars in the vicinity, according to Kurram Agency Political Agent Ikramullah. He added the weight of the explosive material has not yet been ascertained. The political agent said it was not a suicide attack as the explosive material was installed in the car parked in the area. A compensation amount of Rs500,000 each has been announced for the families of deceased people, while Rs100,000 will be given to each of the injured person. Emergency has been declared in all the hospitals of the city. An army helicopter has been flown to Parachinar for evacuation of the injured, according to Inter Services Public Relations. The personnel of army and Frontier Corps reached the site after the blast and cordoned the area. The agency is considered one of the most sensitive tribal regions as it borders three Afghan provinces and was once the main route for cross-border militant activity. In January, at least 25 people were killed and over 65 injured early in the morning when a powerful explosion ripped through a crowded marketplace in Parachinar, officials said. The explosion had occurred early morning around 8:50AM in the city's Eidgah market, where a large number of people were shopping for fruits and vegetables. Since Peshawar is capital of the province that adjoins the tribal areas, three major hospitals of the city — Lady Reading Hospital, Khyber Teaching Hospital and Hayatabad Medical Complex — have been put on high alert. However, administrations of all the three hospitals have told Geo News that so far no injured person has been brought in any of them. Some of the injured have been flown in the army helicopter to Combined Military Hospital in the city. Neverthless, the staff has been alerted and even the nurses and doctors who were off duty, have been called in. There is no dearth of facilities to treat the blast victims at the hospitals, said the administrations. Prime Minister Nawaz Sharif condemned the attack and reinforced that the government would continue with efforts to eliminate terrorism from the country. The prime minister offered condolences to the victims’ families and prayed for the swift recovery of those injured. In a message on Twitter, Pakistan Tehreek-e-Insaf (PTI) chairman Imran Khan strongly condemned the blast which targeting innocent people. He added that the chief minister of the province should ensure all medical and rescue services on an emergency basis.